This week’s Highlands real estate spotlight is on 409 Spruce Lane, a charming home in Highlands Falls Country Club. The home offers three bedrooms and three full bathrooms and is situated on a lot that is almost a half acre in size. 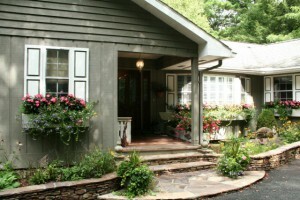 The layout and location of this home make it one to add to your Highlands real estate search. Highlights of this Highlands home include wood floors in the main living area, vaulted ceilings, an eat-in kitchen, a separate dining room, and tile baths. The lower level has a family room with gas fireplace, a full kitchen, plus a bedroom and a bonus room. There are two spacious decks, one for each level, making it possible to enjoy the outdoors and the views outside as well as inside. This lovely home is easily accessible to all that the Highlands Falls Country Club has to offer, close to the clubhouse as well as the entrance gate. Membership to the Highlands Falls Country Club is available but optional. If you have been looking for a mountain getaway in a great location with access to amenities then this home is a must-see. Contact me, Lynn Kimball, today to schedule a private showing of 409 Spruce Lane. I welcome the opportunity to serve as your guide to real estate in Highlands NC, helping you locate a home that suits your needs and your lifestyle. I know Highlands NC and I know Highlands real estate.